Assembly Speaker Toni G. Atkins said Wednesday that despite Republican Party gains across the country, California remains “a very blue state” with a huge Democratic majority. 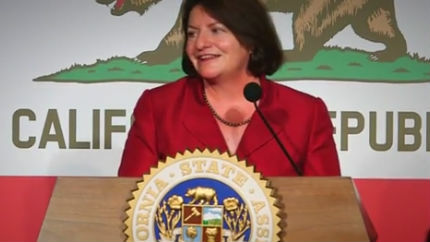 Toni Atkins, speaker of California Assembly. “Despite a strong Republican headwind, a record low turnout and a historically high number of seats to defend, the Assembly still retains a huge voting majority,” she told reporters in Sacramento. Atkins was re-elected by a wide margin, winning 60.2 percent of the vote to Republican challenger Barbara Decker’s 39.8 percent to represent the 78th Assembly District, which includes much of coastal San Diego county. She noted that the state legislature’s biggest achievements — the water bond and the rainy day fund — were approved overwhelmingly by voters.